From time to time, we’ve written about how the consulting firm McKinsey has issued reports on the private equity industry that a well-informed reader would recognize as slanting its data and conclusions in favor of the private equity fund managers, who in the trade are called “general partners”. The reason for that isn’t hard to find. We were told a few years ago by a well placed insider that private equity firms accounted for more than half of McKinsey’s revenues starting in 2002, and that was almost certainly also true of McKinsey’s biggest competitors for their business, Bain and BCG. And even if private equity firms have slipped in their share of total revenues, they are still almost certain still the firm’s biggest single client group. That’s a long-winded way of saying McKinsey can’t afford to bit a hand that feeds it so well. Yet as we’ll discuss, even a McKinsey report which takes care to put not-exactly-positive developments for private equity in the best possible light, nevertheless shows that the “models” that CalPERS has persuaded itself are “innovative” are old hat. The report also separately confirms that as we’ve said, CalPERS is flagrantly labeling an investment approach that is indirect, meaning through outside parties, as direct, because direct investing is what the cool kids are doing. We’ve embedded the McKinsey report at the end of this post. Presenting dodgy data on private equity fund persistence. In an act of intellectual fraud, McKinsey endorses the idea that private equity investors can somehow pick winners. The basis for this myth is that in the past, the top quartile of private equity funds had a greater than chance odds of being a top quartile performer in their next fund. However, the idea that the investors, the so-called limited partners, could correctly identify a top quartile performer even then was foolhardy. For instance, one study ascertained that 77% of the fund managers could cut the data so as to make them look like a top quartile manager. When you boil it down, this graph illustrates the ugly truth of investing in private equity: it’s not attractive unless you can outrun most of your peers investing in the asset class. Rather than question the logic of investing in private equity at all, everyone in the industry has convinced themselves that it is reasonable to believe that they can be the Warren Buffett of private equity….. So it’s not as if these investors are so clueless that they can’t grasp the point that all of them cannot achieve above average results, let alone significantly above average results. Instead, with private equity, there is a desperate desire to be in the asset class for reasons that probably reflect a combination of intellectual capture by the PE managers, political corruption in legislatures that control public fund board appointees, and the need to have a strategy that could conceivably solve the pension underfunding problem over time. The notion that limited partners can pick private equity winners in advance is even less credible than before because the odds of a fund manager with a hot-seeming hand doing well on his next fund is not true any more. Private equity expert Rosemary Batt, at a private equity workshop at CalPERS in 2015, described how the most careful studies of private equity performance had found that after 2000, the odds of a top quartile fund outperforming in the next period were only 22%, meaning a dart toss would have done better. But McKinsey is cooking data to keep this myth alive. It’s obviously rejiggered its own data. 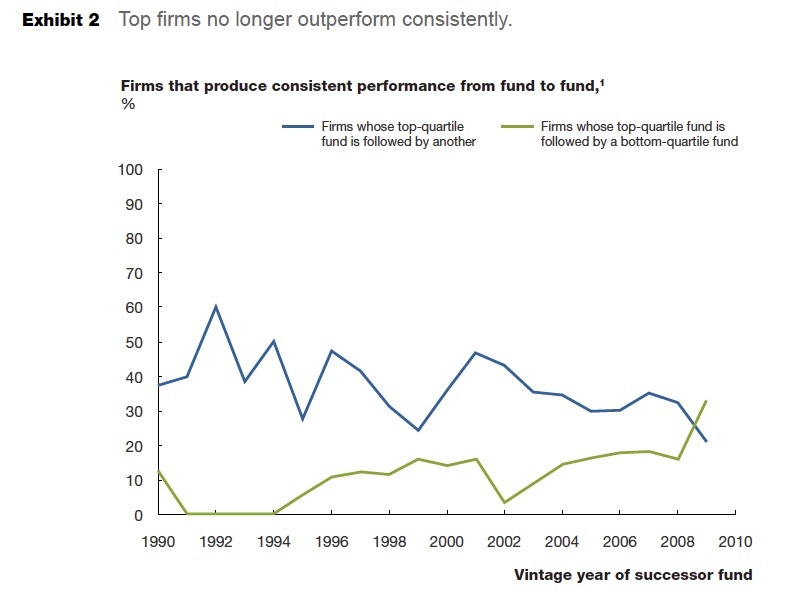 Other McKinsey analysis finds that the persistence of returns—in particular the tendency of top firms to replicate their performance across funds—is not nearly as strong as it once was. Until 2000 or so, private-equity firms that had delivered top-quartile returns in one fund were highly likely to do so again in subsequent funds. Knowing that yesterday’s winners were likely to excel again today enabled limited partners to focus their due diligence on identifying top-quartile funds. Since the 2000 fund vintage, however, this persistence has fallen considerably. Even with the differences in scaling, it does not take much inspection to see that the two charts are very different. The older one’s highest peak is around 60% in 1992. The later one shows an eye-popping 80% persistence in 1996, while the older version showed only 50%. Similarly, the older chart shows persistence at the 30% or lower level in 1995, 1998-2000, and from 2008 onward. The newer chart shows a big plunge in 1997 that is missing from the older chart, a dip in 2003, but better results in the last years shown in the older chart for the last years it presents, 2008 and 2009. One tell with the newer chart is that it refers to “successor funds” without making clear, as the older chart does, that it clearly means successor funds by the same firm. By contrast, in the 2018 chart, and the accompanying text, McKinsey refers to “successor funds” only, as if the funds themselves, which are only legal entities, somehow miraculously gave birth to a next fund. That lack of precision appears to have given McKinsey ample wriggle room, at least in its own mind, to cherry pick data. New data, while not definitive, suggest that number has declined to an average of 30 percent in recent years. 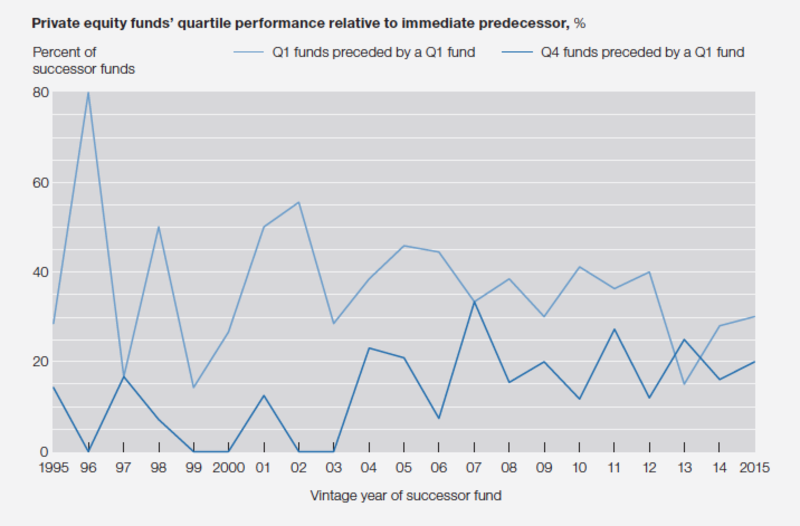 Moreover, the likelihood of a successor fund dropping to bottom quartile has quadrupled over the same time (Exhibit 17). Indeed, follow-on performance is converging towards the 25 percent mark—that is, random distribution—but hasn’t reached that point yet. In keeping, nowhere does McKinsey acknowledge that none other than Antoinette Schoar of MIT, one of the scholars whose studies helped provide the intellectual underpinnings justifying the inclusion of private equity in institutional portfolios, released a study in 2017 that knocked the legs out from under some of her widely-cited earlier work on the persistence of the out-performance of top private equity funds. This is more significant than it might appear. Historically, the sources of return in private were understood to be leverage and financial engineering. The general partners later added the sales pitch that “business building” was a third source of return. And for smaller deals ($350 million and below), that often was true, since private equity firms would target companies that had had a strong track record but were close to or had topped out in their current markets, and needed some help to expand their geographic or product reach. However, another approach to “business building” is “consolidation,” which in the past in private equity has been called “rollups”. McKinsey’s stress on synergies, as opposed to the idea of providing capital or know-how to increase growth, implies that the source of return derives from decreasing competition in the industry a portfolio company exists in by reducing the number of players. So the private equity industry in that sense is earning returns by increasing monopoly/oligopoly rents in the economy, which has the effect of hurting the economy overall and consumers particularly. Why didn’t McKinsey talk about consolidation in a more straightforward manner? It may be because rollups don’t have a good name because they are difficult to pull off successfully. But with so much money chasing so few deals, general partners appear more willing to try investment approaches that have at best a mixed track record. Engaging in naïveté or porcine maquillage application by presenting improved general partner grifting approaches as strategically virtuous acts. McKinsey touts how general partners are “building their spine,” which is a peculiar metaphor for an industry with large, established players. When PE firms trim or eliminate their back offices, they outsource the function so it can be billed as a direct expense of each fund. In other words, the motive has absolutely nothing to do with “professionalism” or sticking to their knitting. It has everything to do with shifting former costs of the fund manager onto fund investors. In all cases I know, the GP outsourced its back office so that it was no longer part of the firm overhead and hence no longer a cost responsibility of the PE firm itself, thereby allowing the cost to be passed on to the fund directly. McKinsey made the same gaffe when discussing general partners’ internal operations groups. McKinsey doesn’t understand that the key driver of whether the operations group is inside or outside is who pays for it, as in the limited partners or the private equity firm. A second approach for GPs—and a more important one to debate—is whether to build internal operating groups or hire externally. Certainly, some internal operating groups have delivered strong value, particularly at firms with strong specialties in industries or certain asset classes. However, when firms venture off their turf by exploring a less familiar industry or function, their specialized skills are less valuable. The same holds true when firms expand rapidly; experts have only so much time in the day. And when firms attempt large-scale operational projects such as overhauling legacy systems or digitizing or outsourcing big pieces of the company, again internal capacity is often exhausted. Moreover, some of the largest internal operations teams have been scaled back, because they were a large fixed cost or ultimately too far below scale to have sufficiently specialized expertise. Leading firms supplement their operating capabilities with help from outside, and thus bring to bear a far greater range of operational expertise than could be accomplished within a leaner internal group. I know many ex-McKinesy professionals who make a very nice living working for private equity firms on an ad-needed basis. And this practice is hardly new. The SEC sanctioned KKR as an example of the widespread practice of presenting prospective investors with a “team” which the investors assume are all employees of the general partner and hence part of his overhead, when many are “advisors” and will be billed to portfolio companies as expenses. Looking past the very big dog dog that didn’t bark. There is no mention whatsoever of the very high proportion of transactions where both the buyer and seller are PE funds. Four main models exist for accessing private equity, ranging from the most external (investing via fund-of-funds managers) to the most internal (via “direct” investment in companies). Institutional investors can be categorized into three archetypes based on their approach to private equity investments – indirect investors, active fund and co-investors, and professional direct investors – each with different norms as to investment approach, organizational setup, and risk management approach. Most institutional investors invested in private equity are indirect investors. “Indirect investors” invest primarily through funds. Some indirect investors have also started to establish deeper “strategic partnerships” with select GPs to better align incentives and reduce fees. McKinsey and CalPERS ignore glaring conflicts of interest problems. No one in Sacramento is willing to hear that the SEC said that over half the private equity funds they examined, and particularly the big ones, were cheating, often in ways that would be called stealing in other ways of life. They also choose to ignore that private equity firms are extremely skilled at setting up “heads I win, tails you lose” situations, and that CalPERS’ pet new ideas set them up to be on the wrong end of self dealing. One notable recent development is the super-sizing of these SMAs, as LPs seek broader, deeper, more strategic relationships with a smaller number of trusted managers. These partnerships tend to be characterized by larger allocations, “most favored” fees, and increasingly, terms that reflect perfor-mance across the entire relationship rather than in individual transactions or asset classes. What about “conflicts of interest” don’t you understand? The SMA capital is supposed to be invested pro rata with some or all the funds the PE firm manages wherever “appropriate.” That “appropriate” language give the general partner the latitude to feather his own bed first. Not only does the SMA investor have to worry that they are “not inappropriately” excluded from some attractive deals because their economics aren’t worth it, but the fund investors also have to worry that some of the opportunities that would otherwise go to the fund are being allocated away to the SMA. But if you were to believe McKinsey, these investors are going to get “platinum” treatment even though they usually pay cut-rate fees. How does that make any sense? Why should the general partner not, to the extent he can, allocate the deals with the biggest upside potential to the funds where he gets the largest share? Ironically, the best protection these SMA investors have is that general partners are (by their own admission in private) poor judges of which of their deals will turn out to be the stellar performers. CalPERS continues to preen over its “innovations” for approaches that are old hat. CalPERS again and again makes itself a laughingstock by making sure it hears only from those who won’t challenge its unwarranted high opinion of itself. It then compounds the error by showing it has no concept of the considerable limits of its knowledge. Over the years, CalPERS management has treated its private equity strategy like a toddler treats a Netflix queue. Let’s try this. No, let’s try that. I don’t even know what that is, but it sure looks cool. In McKinsey’s recent LP survey, over 70 percent of LPs stated an intention to build these [co-investment] capabilities. However, making this shift can be challenging, and success depends on LPs’ governance model, capabilities, size, and risk tolerance. The data show that, while LPs have increased their co-investment activity few have become true direct investors. The value of co-investment deals has more than doubled since 2012 (totaling $104 billion in 2017), but direct investment has remained essentially flat, at around $10 billion (Exhibit 18). A recent survey finds something similar: the number of LPs making coinvestments in PE rose from 42 percent to 55 percent over the past five years, while the proportion of direct-investing LPs barely grew, from 30 to 31 percent. Both LPs and GPs have found that co-investment has its challenges. For LPs, not only are co-investments hard to scale, but academic research shows significant variance in returns, which can make it difficult to get approval from investment committees for these fast-moving transactions. The irony is that CalPERS has fallen behind in coinvestments, which can serve as a bridge to building more investing expertise, and that CalPERS has the image and scale to make it far more realistic than for just about any pension fund to move into direct investing. For instance, Oxford professor Ludovic Phallippou has repeatedly stated that he has highly qualified former students who would work for CalPERS. These are a minimum, there are probably others. Despite it being an “indirect” approach, CalPERS’ need to disguise the fact that they are simply setting up some big SMAs and trying to misbrand them as “direct” means that CalPERS is going to layer in additional costs, complexity, and potentially rigidity. So Eliopoulos is going to achieve the worst of all possible worlds: a guaranteed to be costly and difficult approach, with no apparent benefits to CalPERS. Are they so desperate to escape transparency and accountability that they deem it justifiable to shaft their investors to this degree? This entry was posted in CalPERS, Private equity, Ridiculously obvious scams on June 7, 2018 by Yves Smith. When private equity firms trim or eliminate their back offices so that they can charge these expenses to the fund investors, is this typically a genuine outsourcing or is it more a case of ‘same people, same offices, same telephone numbers’ but different name? It sounds like from this scam that private equity firms could have a whole bunch of its people listed as ‘consultants’ that could also be charged to the hapless fund investors. Thank you, Yves, for highlighting the role of McKinsey. The firm has an inglorious role in the European banking industry and British politics. McKinsey was on both sides of the EU mandated restructure of Belgium’s KBC Bank after that bank’s bail out in 2008 and has been accused of profiting from conflicts of interest. It was also at the centre of Standard Chartered’s ill fated forays into Korea (Korea Exchange Bank) and Swiss private banking (AmEx). This was facilitated by the then Standard Chartered CEO being ex McKinsey. From 2015, Barclays began recruiting and seconding from McKinsey, often hucksters touting IT and India solutions to everything. I left the bank in June 2016 and, on the way out, pointed out the above allegations and how one should be wary of the well connected so and sos coming in. The arrival of McKinsey at Barclays coincided with the arrival of Jes Staley, who knew them from his days at JP Morgan and Blue Mountain. With regard to British politics, former Tory politician William Hague came from McKinsey. Under New Labour and Cameron, the parasites wormed their way into all corners. Many professionals, call them lifers if you will, in the civil service and City are puzzled by what value McKinsey brings. Just as an English accent can work wonders in the US, so can an American in certain quarters of Blighty. What is it about “Regression to the Mean” that’s not understood? The fault dear Brutus lies not in our stars, but in ourselves…. It will take more than porcine maquillage to put him together again! Yes, but the graphic on the next page is awesome… captures the PE spin in a single image. Gotta give the gang at CalPers points for consistency! If you take a levered position in the s&p, via SPY or futures, eg, just buy the indexes on margin, does PE at similar leverage outperform the results on a net basis? There have been several studies that have created PE replication strategies in public markets by focusing on the sort of public companies PE firms would buy. They also have clear decision rules for when to sell companies that were added to the portfolio. They deliver 12% to 14% returns over time, which is in line with or even better than what PE delivers net of fees in this low-returns world. And on a risk-adjusted basis, this is a way better result, since for PE the rule of thumb is to require 300 bps over the selected public markets benchmark to allow for illiquidity risk. As for levering up the indices, folks like Wilshire will tell you that produces worse results due to PE being less volatile and delivering slightly lower net returns. But that’s dubious. First, there is a Sharpe ratio fallacy they ignore, that any strategy with more frequent price measurement will look more volatile. PE is valued only once a quarter. More importnat, PE valuations are openly admitted to be “smoothed” which means phony. The valuations of PE portfolio companies are exaggerated around the time PE firms are raising new funds (typically year 4 or 5 of their last flagship fund), in bad equity markets, and at the end of a fund’s life, when the remaining holdings are dogs they are still valuing at prices that are almost certainly higher than their eventual sales price. Needless to say, regularly exaggerating valuations and misrepresenting how low PE valuations would be in bear markets means 1. returns overall are clearly overstated, meaning whether PE really does any better than levered equity is questionable and 2. the claim of lower volatility is an accounting fiction. McKinsey not only Private Equity friendly consultant. Alvaraz & Marsal was used by Univeristiy of Louisville to clean up its foundation. While they found corruption on the spending side of foundation, they forgot to mention all the private equity. AM has their own private equity firm and does lots of work for PE firms. A&M is building up a European base from London and hiring some top regulators and financial services professionals. I am not at all surprised by what you mentioned in this article. All these conflicts of Interest are well known. There is a bit of a debate in Germany around their recent work for the immigration system. Apparently, they were not very successful in simplifying the asylum seeking system/process, but were paid (again) handsomely for it. The truth is, McK is such a powerful name, that young employees will be drawn by it and (mediocre) CEOs and organisation will always employ the consultants to spare them the effort of thinking and the responsibility. I am no fatalist and do not wish to fall into despair, but I have yet to think of an approach which could improve the situation. Apart from simply hiring good people, training and developing them internally and avoiding consultants altogether. Regarding McK in Germany and the asylum system, I wanted to add a few links (please see below), which some might find interesting. They are in German, but can easily be translated with Google Translate.